US Cellular's just big enough of a carrier to command a few exclusive handsets of its own -- especially from a company like Samsung that somehow manages to announce about fifteen new models a day, 365 days a year (not really, but it'd be easy to think that they did if you didn't pay attention). Take these two puppies, for example; first up is the music-oriented r520 Trill slider (pictured left), which counts Bang & Olufsen's ICEpower signal processing and 1GB of onboard memory expandable to a total of 33GB as its headline features. To the right we've got the r850 Caliber, a full-touch piece with a 3.2-inch WQVGA display, TouchWiz, a 3 megapixel camera with video capture, and full HTML browsing -- not shabby, assuming the price is right. We don't have pricing or availability on either of these bad boys just yet, but we'll keep you in the loop. 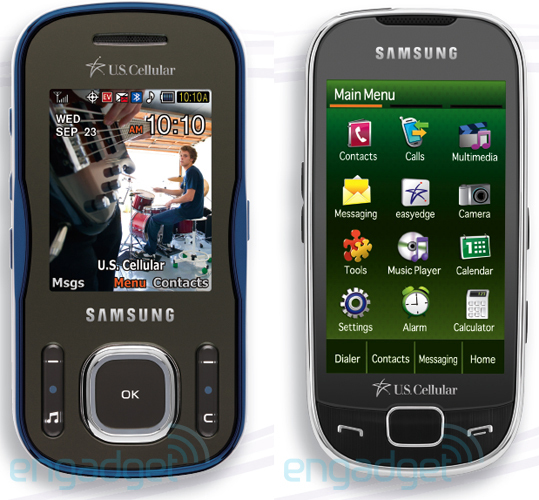 Samsung Trill and Caliber coming to US Cellular originally appeared on Engadget Mobile on Mon, 28 Sep 2009 02:29:00 EST. Please see our terms for use of feeds.